Excuse the crappy photo but it did occur to me that the ANZ Bank may have some security concerns about customers taking photos of their teller area. So I was quick. The photo is quite flattering compared to the actual poster in which Tony Barber looks old and unwell though with good teeth. 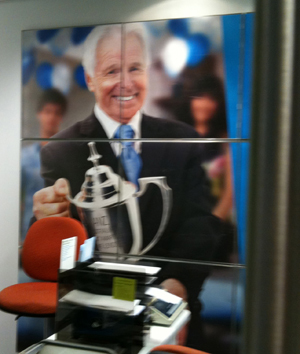 I know that’s ageist; perhaps the ANZ is targeting older customers who yearn for the days of ‘Great Temptation’. There may be a financial theme there. The poster trumpets ‘Australia’s most awarded bank’. I’m not sure how they work that out; it doesn’t say over what period of time and it doesn’t say which awards. Now if it were true, how should the bank promote such a thing? Well. They’ve gone for an ageing quiz show host nursing a trophy engraved with, “Australia’s Most Awarded Bank”. Where did they get this trophy? I’m thinking it didn’t come from an awards night where they tally up all the results then present the “Australia’s Most Awarded Bank Trophy” at the end. I’m thinking they made it up. Tell me I’m wrong, ANZ. You’ve fabricated a trophy for the purposes of visually representing an unsubstantiated claim. Did you engrave it yourself or just Photoshop it? If you’ve won any awards, it’s not for ethical advertising. It’s probably for treating your customers like idiots. Haha! They probably went to the local trophy shop and had one engraved. And yes, you are right: banks get really fussy about people taking photos in their branches. In recognition of your effort, I hereby award you the “Most Swift & Courageous Australian Bank Merchandising Photographer Award.” You can pick up your award at any local trophy shop. Just bring $50 with you. Thanks Jeffry, I am honoured to receive such an award and would like to thank my colleagues at Free Beer, without whom I would have won it anyway. Given my experience with ANZ, the awards they have won must have been decided by ex bankers. You dont win if you remember customers names but rather pretend like they haven’t been coming to the branch for 12 years. Got me stuffed how they win everything, I cant wait to be rid of them…and when I leave I know they will ring up and ask why, even though I have expressed my concerns to the staff before I left and they did nothing.